Can anyone threaten Kansas' streak of Big 12 titles? The Big 12 was the best conference in college hoops a year ago, and it’ll be in that conversation once again in 2017-18. We’ll see if Kansas runs away with the title again, but even if the competition isn’t close at the top, this league has amazing depth as usual. It would be quite a shock if Kansas doesn’t claim its 14th straight Big 12 title this winter. The conference is deep – the top eight have legitimate NCAA Tournament aspirations – but the Jayhawks are head and shoulders above everyone else at the top. Bill Self lost National Player of the Year Frank Mason III, but he could have another in Devonte’ Graham, who averaged 13.4 points and 4.1 assists as Mason’s sidekick last season. Graham leads a backcourt that’s deep and dangerous. Sviatoslav Mykhailiuk and Lagerald Vick are lethal shooters, and the Jayhawks add another perimeter threat with Mississippi State transfer Malik Newman becoming eligible. 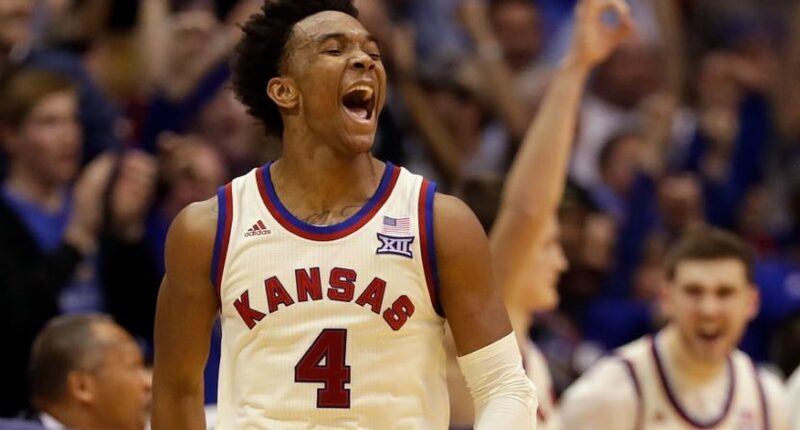 After last year’s deflating Elite Eight exit, Kansas could find itself back in the Final Four for the first time since 2012. The Horned Frogs nearly ended their drought last season. After losing their last seven regular season games, they won the NIT as a No. 4 seed. Jamie Dixon brings back his top six players from that team and replaces backup forward Karviar Shepherd with VCU transfer Ahmed Hamdy. TCU isn’t ready to even sniff the title race, but this team has the pieces to make the NCAA Tournament and win a game or two once they get there. For the first time since 1993, neither Texas nor Oklahoma made the NCAA Tournament in 2017. Expect both to return this coming March. Sophomore guard Andrew Jones chose to return to school after testing the draft waters. He’s a skilled shooter who needs to improve on his consistency, and with his length he’s a great fit defensively for Shaka Smart’s system. Smart lost his two starting forwards, Jarrett Allen and Shaquille Cleare, but he solved that problem by snagging five-star recruit Mohamed Bamba and Columbia transfer Dylan Osetkowski. The Sooners were one of the youngest teams in college hoops last season, but the plus side to that is a bunch of young fellas got plenty of experience. Lon Kruger has a balanced group – you won’t be seeing any Buddy Hield’s dropping 25 points per game – but watch out for sophomore guard Kameron McGusty. He averaged 10.9 points and shot 35.2 percent from three last season. Iowa State hasn’t finished last in the Big 12 since 2011, the year before Fred Hoiberg brought them back to the NCAA Tournament. They’ll fight it out with Kansas State and possibly Oklahoma State – we’ll see how new hire Mike Boynton works out – and when the dust settles the Cyclones could be back in the cellar. Steve Prohm managed two years of success largely with Hoiberg’s players, but after losing 73 percent of their scoring, 56 percent of their rebounding and 78 percent of their assists, the Cyclones are back to rebuilding. In classic Iowa State style, Prohm has brought in three transfers who should see ample playing time: Jeff Beverly (UTSA), Zoran Talley (Old Dominion) and Hans Brase (Princeton). They’ll contribute, but it won’t be nearly enough to make up for what this team lost.